Last year was Mozart year and we saw a steady flow of records, both reissues and new recordings but there were few, if any, to challenge these 55–60 year old recordings. Sonically they are quite acceptable and the Vienna Philharmonic do actually leap out of the speakers life-like in the long orchestral introduction to Martern aller Arten, recorded in October 1946, more lifelike than the Philharmonia recorded six years later. These arias (tracks 1–9) were originally released on an early LP; I don’t know if they were in the same order then as they are here. Since they are not in chronological order according to recording dates, nor organized according to operas, it seems that someone at Preiser Records just pressed the random button on the computer. But there ends my criticism. I can’t imagine better Mozart singing. I can imagine Mozart singing that is different and maybe on the same level, but not better. I know that there are listeners out there who feel differently about Schwarzkopf, finding her artificial, over-detailed, haughty; those listeners can stop reading here. To those of you who are still with me I can report that she can be extremely detailed, but more often than not she just pours out wonderful, natural singing, demonstrating her sense of line and nuance. What is obvious from the very beginning is her way of identification with the different characters, and I will come back to this. Let me just give some background information about the singer, who retired from the concert platform in 1979. She belonged to that “lost” generation of singers whose early career coincided with World War II, which meant in most cases that an international career was not possible until after 1945. By then Schwarzkopf was already 30. Within a couple of years she was heard in London, Milan, Salzburg and other important music centres. She also embarked upon a recording career and some of her earliest records can be found on this disc. The good thing about this delayed career was that when she finally became an international name she was already a fully-fledged mature artist and this can be heard on these thirteen arias. She sang many different roles early in her career but gradually reduced them to a handful, which she kept until she left the opera stage in 1967: the Marschallin in Der Rosenkavalier, the Countess in Capriccio and the three great Mozart parts – Donna Elvira in Don Giovanni, the Countess in Le nozze di Figaro and Fiordiligi in Così fan tutte. Fiordiligi is absent from this collection but there are two complete recordings, with Karajan and Karl Böhm. 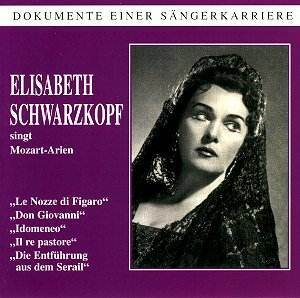 Schwarzkopf was also one of the greatest Lieder singers ever and her care for words and nuance was something she also brought to the opera stage, a characteristic not liked by everyone. The recital opens with Susanna’s aria from the second act of Le nozze di Figaro, a part she sang in Salzburg in 1947. The recitative Giunse alfin il momento (At last the moment is here), when she anticipates her marriage to Figaro, is very detailed. Schwarzkopf colours her voice and wrings the last drop of meaning out of every word – but who is Susanna? She belongs to the servants but she is no simple lower class maid. She is a clever girl who is a confidante of the Countess and she has intrigued against the Count. In other words she has a sharp intellect and that is exactly what Schwarzkopf catches. The aria proper, on the other hand, is a dreamy love song, longingly sung but still with dignity. Compare this to Zerlina, the peasant girl in Don Giovanni. She is indeed an unsophisticated girl. She knows nothing about the nobles and her first encounter with Don Giovanni shows her innocence. Schwarzkopf’s interpretation of Zerlina’s two arias (tracks 2, 8) is distinctly different from her Susanna: simpler, more naïve. Returning to Figaro we also hear her true role, The Countess. We hear an aristocrat with noble bearing. Her voice is not absolutely rock-steady but that only shows that this Countess is a vulnerable person. Dove sono (track 9) especially demonstrates her marvellous pianissimo singing, spinning a thin thread of tone through most of the aria, only to change gear to a full-voiced and thrilling end. For the third Figaro role, the teenage boy Cherubino, she does indeed adopt a boy-like tone, portraying him as the 17-year-old who really doesn’t understand the signals his hormones send him. From Don Giovanni we also get Donna Anna’s second act aria Non mi dir, so elegiac, so sad, but she also has the required power for the concluding “Forse un giorno...”. This reminds us that she was at about the time of this recording Bayreuth’s Eva in Die Meistersinger and also sang Elisabeth and Elsa. Her Donna Elvira, memorably sung on Giulini’s complete recording more than a decade later, is also excellently executed here (track 10) with that great Mozartean Josef Krips giving full support back in 1947. It is indeed remarkable to notice that there is no discernible difference in voice quality between 1947 and 1952, not even with the much later stereo recordings from the early sixties. She managed to keep her voice intact for a very long period, partly due to her wise choice of repertoire. I could go into detailed descriptions of all the remaining arias, the wonderful Il re pastore is beautifully sung, but I would like to urge prospective buyers to lend their ears especially to the very last item, the long and notoriously difficult Martern aller Arten from Die Entführung. She sang the part for some years after the war but then abandonned it, which was a pity because it would have been great to have a complete recording of it. Her singing here is as near to perfection as one can possibly get in an imperfect world. This is probably the most taxing of arias with its high-lying tessitura, its big leaps, its large range downwards, its dramatic outbursts, long-held notes and, at the end, demanding coloratura. And of course Karajan secures wonderful playing from the Vienna Philharmonic. I hope I have made it clear that I admire the whole recital tremendously and recommend it strongly to every listener with even a remote interest in Mozart-singing - or singing in general.